As exciting as it is to launch a new product here on The Grommet, for us, it gets even better when we get to see how the world reacts to these innovative ideas and passionate entrepreneurial stories. For our Makers, a Grommet launch is just the beginning of some well deserved attention. This holiday season, we've seen many of our Makers names in lights and we couldn't be more proud. t spheres aromatherapy balls launched this fall and they're popularity quickly spread. Daily Candy featured them in a special gift guide along side other interesting gifts. Country Living, a publication that covers all things home, named The Grommet as a Must-Visit Site! 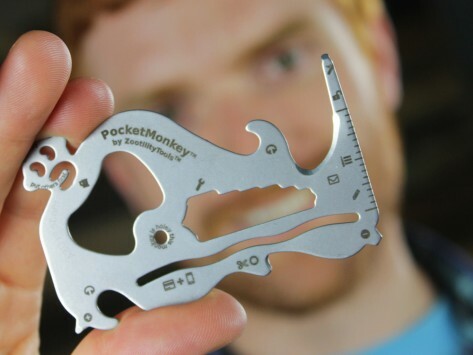 PocketMonkey made the list in Bob Vila's Gift Guide for Dad as part of Yahoo! Homes. The Huffington Post holiday section listed The Grommet as a top site for unique gifts too! Andrew Bender, a travel write and columnist for Forbes, listed our Stewart Stand stainless steel wallets as one of many ingenious gifts for travelers. ReadWrite (formerly ReadWriteWeb) listed The Grommet as one of 5 unique and innovative online shopping sites. The 2014 Consumer Electronics Show (CES) is happening in Las Vegas come January. Our Maker, SpeeCup, received a big award as they are named as an honoree for the Innovations Design and Engineering Awards. Products entered in this prestigious program are judged by a preeminent panel of independent industrial designers, independent engineers and members of the trade media to honor outstanding design and engineering in cutting edge consumer electronics products across 29 product categories. Congratulations, SpeeCup! It's exciting to see these Grommets rise to the top! Remember that every time you purchase or share a Grommet with your network you are helping these Makers succeed. We can't wait to see what's ahead for this group!